I am not fond of having steamboat outside. I am not fond of balls - dislike fishballs, sotong balls, crabmeat balls, almost all kinds of balls. If the place has no aircond, then it is usually a very sweaty affair. With the hot soup burning our tongues coupled with our humid weather, I usually get very agitated eating steamboat. And if the place has aircond, then my hair and clothes will end up smelling like food which forced me to wash my hair later on. But. But. But. I love love LOVE steamboat at home. I like the freshness of the ingredients. And I get to eat more of other stuff other than balls. And I like mum's mix of homemade chilli. And usually we eat for hours. We eat them again and again...resting for an hour or two and then get up to eat again. 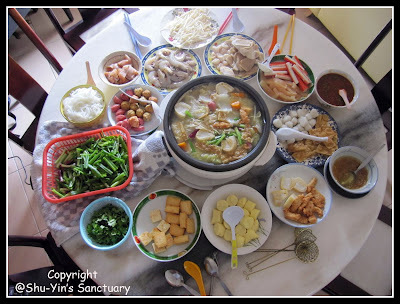 Today mum made steamboat again. Oh, I ate many prawns, and the crab makes the soup so sweet. I'm gonna have second round and third round. Ohhh...I love steamboat at home. When Shern Was Inside My Belly!